Things are looking up at the tiny settlement of Kingscote. We start the week with a wedding on board the John Pirie. Mary Ann Powell, who travelled as an emigrant in steerage with her two brothers and sister-in-law, marries one of the Pirie crew – William Staple, who intends to remain in South Australia. After the ceremony they all repair to the tents for dinner, music and dancing. Things liven up later, with ‘one or two amicable fights, amongst which the Bride and Groom were very conspicuous’, John Woodforde reports. But squabbles aside, the celebration seems to lift the general mood to everyone’s satisfaction. Come Monday morning though, Samuel Stephens’ troubles return. His two officers are still largely absent. His second in command, Thomas Hudson Beare has not reported for duty, although his wife seems to be improving, and Mr Birdseye apparently only consents to turn up for a few hours in the middle of each day. A harassed Stephens is relying more and more on Henry Wallan, one of the original settlers, who begins to supervise the company men in building a store. When Mr Beare turns up on Wednesday 31st to resume his duties Stephens ignores him. And so it goes on. Some of the other recalcitrants have turned up again however. James and Joseph Jones seem to have tired of their strike and come to Stephens ‘begging that I would receive them again’. Strikes are all very well, but there is only one employer on this Island at the moment, and he has all the provisions as well! And there is more good news. Captain Morgan reports at the end of the week that Mrs Beare is much better. Her children are able to return to her and she is able to acknowledge them. What a bewildering experience it all must have been for these children. On the Africaine Mary Thomas is a little happier. She has made friends with the cabin cook who, in exchange for an extra glass of rum, will sometimes cook something for her. Mind you the fare does not sound very appetising – salt beef pie, rice pudding without eggs or milk and cake made with dripping. Still, beggars can’t be choosers and Mary is ever the optimist. She finds some aspects of shipboard life more difficult though. Earlier in the week she had her first experience of shipboard discipline, and found it brutal and distressing. On the Buffalo progress is slow and George Stevenson continues his relentless critique of his employer, Governor Hindmarsh. There is no Sunday School again and Stevenson laments the lost opportunity to school the emigrant children. He also gives us an interesting insight into the uncomfortable conditions the poor steerage passengers must endure. The passengers are strictly segregated on deck and the only walking area accessible to steerage travellers is alongside the pig pens, which are ‘generally in a horrid state of dirt and uncleanness’. These injustices will ‘tell eventually’ he writes darkly. This week is also a sad one on board the Buffalo. One of the sailors dies of consumption (tuberculosis). He is said to be ‘sensible to his latest hour, and spoke of his own death with the calmness and hope of a Christian.’ When he is buried later that evening, the shipmate who nursed him throughout ‘shewed by his sobbing and tears that a sailor can feel like a man’. It is a salutary occasion for all on board. 28th (Sunday). The wedding took place this morning with all becoming solemnity & all due honours. Mr Stephens would not allow them, to bring any Spirituous Liquours. 29 August-Fresh breezes and squally; went in the A class of net fishing boats used on the Thames estuary. The Rapid’s boat was built specially for the Colonization Commissioners by W.T. 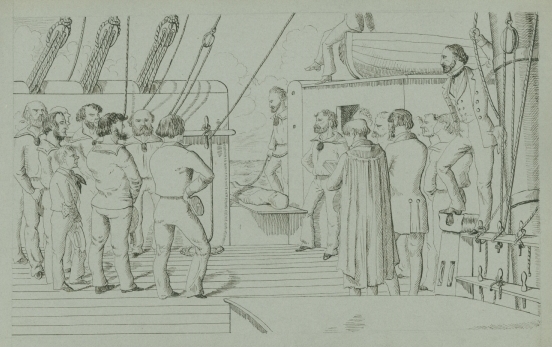 Gulliver of Wapping hatch-boat to examine the northern side of the bay, distant about four miles from Kingscote. There is a well of fresh water here, dug in the sand, close to high water mark, which supplies the settlers at Kingscote. The country here is low, and the soil appeared much better than that we had seen before; and altogether, it struck me that a settlement might be formed here at some future period, to great advantage. … Some of the runaway sailors coming in I gave them a small supply of provisions but told them I could not further communicate with them while Capn Ross was in the Bay. I had to manage the men myself to day as usual, having no one to assist me, except Mr Birdseye who appears at the store for 3 or 4 hours in the middle of the day. she has not lately, I believe this is an answer to prayers. 3rd Called the hands at ½ past 5 A.M. & went on as before & often, very often, looked out in hopes of seeing the Emma that I might get one officer at last to stand by his post & assist me in the present emergency. I have still no communication from the L.M.P. At night paid the men & afterwards received a note from the two men (James & Joseph Jones) who deserted their duty last Monday begging that I would receive them again!! degree qualified to act as Schoolmaster, be sent out. Mustered the crew & emigrants, & read the The regulations which govern the behaviour of members of the Royal Navy. Articles of war (by the Governor). Lowered the topsails in squalls. that a sailor can feel like a man. … We had now been rather more than two months at sea, and though we were all well stocked with clothes I found it necessary sometimes, as, I believe, most of the passengers did, to wash a few small things such as pocket handkerchiefs, partly to prevent them from getting mouldy, a condition to which I found everything very liable, whether dirty or clean. I mention this to show that our supply of water was sufficient with economy for so doing, but I could not boast of their whiteness when washed in muddy water. Some of the steerage passengers, I understand, washed all their clothes. How they managed it I do not know, but one of the women washed for the surgeon I before mentioned (an Irishman), and, of course, charged an extravagant price, which caused him to make the observation in my hearing that every man while on board of ship ought to be his own washerwoman. SEPTEMBER 1.-We had by this time managed a little better with regard to our cooking, that is, we had made friends with the cabin cook, and by the occasional bribe of a glass of rum he would bake for us whenever he could; sometimes a beef steak pie (salt beef, of course) or a rice pudding (the latter without either eggs or milk) or a dripping cake. Dripping, which in some measure answered the purpose of butter, I purchased from him at a shilling a pound. The wine also was better than at first, whether from the effects of the voyage or not I cannot tell, but we had some of a very fair quality. A reference to the teachings of Greek philosopher Zeno. Zeno was never at sea in an Emigrant ship. On the Africaine the Gougers have trouble with one of their servant girls and a baby makes his appearance in the middle of a raging storm. On the Buffalo the dog Lion falls overboard and the ship must turn around to try to recover him, while the Tam O’Shanter seeks in vain for the thief on board. Thanks, Neil. We’ve fixed that up.